Iowa blew past Missouri, 68-52, with Megan Gustafson’s lead. Louisville routed Michigan, 71-50, behind Asia Durr’s big play. South Carolina beat Florida State, 72-64. Texas A&M survived Marquette, 78-76. UConn held off Buffalo, 84-72. Arizona State outlasted Miami, 57-55. Oregon downed Indiana, 91-68. 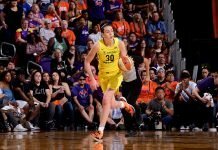 Sabrina Ionescu notched her 18th career triple-double in the process. Teaira McCowan paced Mississippi State past Clemson, 85-61. Second round, part II tomorrow. Maryland and UCLA will meet 41 years after they made women’s basketball history. Oregon is playing with their hearts on their wrists. BYU’s no Sunday play policy has them preparing for the Tournament in a unique way. The Cougars’ team chemistry has fueled their turnaround. Towson is upbeat despite their first round exit. Seedings don’t always hold true in the Tournament. Syracuse has wellness meetings for players. Baylor and Cal’s centers will be of attention tomorrow. Shannon Coffee’s contributions for Stanford go beyond basketball. Touted Maryland freshman Shakira Austin is living up to expectations. Five players have left Indiana State. Holly Warlick wants to keep coaching at Tennessee, but her future is uncertain. One secret to Brenda Frese’s recruiting success at Maryland is that the early bird gets the star. Candace Parker’s transition to the broadcast booth has been a blur.